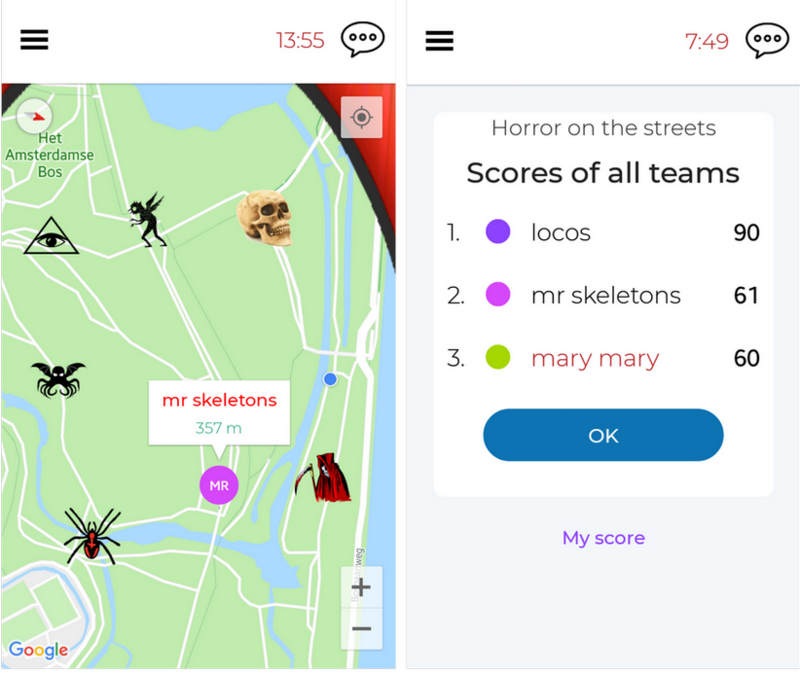 You can now show to players the other teams locations and game scoreboard in the app. One aspect that drives players forward in the game is competition. This is amplified by comparing your own performance to the other players` levels. What happens during the game? Note that for these features to work, mobile data connection (internet) is needed in players` devices. 1. During the game all players will see on the map where the other teams are with a small “tail”. There is a small 10-second delay in the actual positions. Once a team finishes, their location is not shown on the map anymore. 2. From the side menu, all teams scoreboards are accessible. It will also include bonus points if the instructor adds points to photos/videos on the results photowall. Taking this into account, you can develop a full new game concept where the teams have to keep an eye on where other teams are (especially with Match it allows strategizing) and how well they are doing.